As male game birds go, the pheasant has to be one of the most striking. Larger and more colourful than a partridge, with a spike of tail feathers that gives it a wonderful silhouette in flight. Up close, the male bird is a beautiful mixture of chestnut brown, oily dark green, black and red feathers with a precise white ring around its neck. Experimenting with various methods of dealing with these problematic birds, I discovered two things: the breast and leg joints are nearly always best cooked separately and brining beforehand greatly improves both the flavour and texture of both. Pheasant is a notoriously tricky bird to cook, with a great tendency to become dried out and tough. But as they are in abundance at this time of year and readily available in butchers and most supermarkets, it’s a pleasure to eat these birds while they are in season (October to the end of January). Experimenting with various methods of dealing with these problematic birds, I discovered two things: the breast and leg joints are nearly always best cooked separately and brining beforehand greatly improves both the flavour and texture of both. Because they are relatively small birds, they only need to stay in the brine for up to 6 hours for it to take effect. I made a simple solution of 4lts filtered water to 1 cup of fine sea salt and 4tbsp sugar. I added bay leaves and juniper berries (lightly crushed) to flavour the brine. Bring the mixture to the boil to dissolve the salt and infuse with the aromatics, allow to cool and submerge your birds (this quantity is sufficient for two or three). Leave it in the fridge for up to 6 hours (try to do a minimum of 4), then remove the birds and rinse with clean water. You can then joint the bird, removing the legs and breasts. That way, during the braising, you can remove the breasts as soon as they are ready, leaving the legs to cook for the longer time they require. A classic Normandy recipe for pheasant is to cook it with apples and cream, both of which go well with this mildly gamey tasting meat. Celeriac, mashed with potato and plenty of butter, is a perfect accompaniment to this dish. First make the brine: put all the ingredients into a large pot and bring to the boil to dissolve the salt and sugar. Allow to cool to room temperature. Find a container – stainless steel, ceramic or plastic – don’t use aluminium which will taint the flavour – large enough to fit both the birds and the liquid. Refrigerate for 4-6 hours then remove the birds, rinse well under cold water and dry thoroughly. You can now keep the birds for up to 2 days in the fridge until needed. 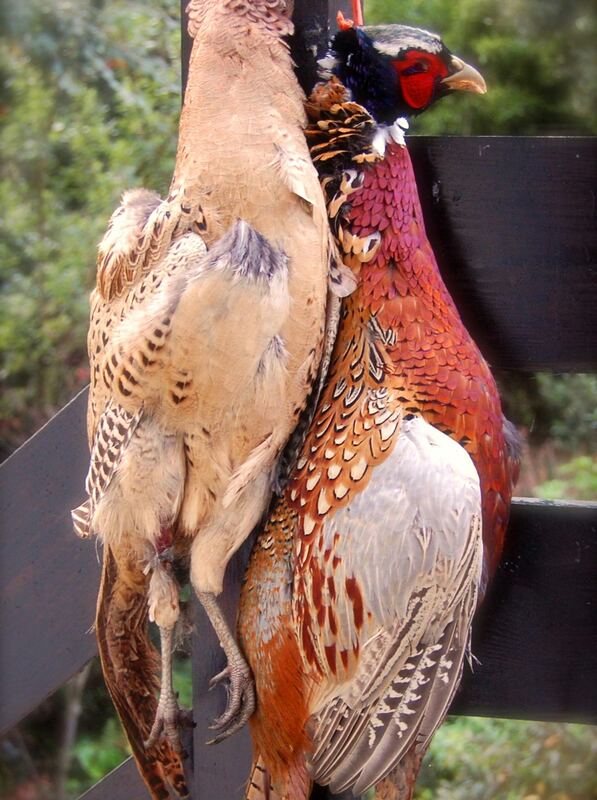 To joint the pheasants, put the bird on its back on a board and gently pull the leg away from the body. Slip the knife between the leg and body and cut through the skin. Bend the leg back to snap and release the joint and cut downwards to remove the leg from the body. Repeat on the other side. To remove the breasts and wings together, keep the bird on its back, cut through the ribs to remove the under-cavity so that you are left with both breasts and wings on the bone. Using scissors, cut through the length of the breast bone so that you are left with two breasts, on the bone with wing tips attached at each end. Season the pheasant joints and, in a large casserole, heat some oil. Brown the joints on each side and remove on to a plate. Fry the bacon pieces until crisp then add the shallots and thyme and cook for a couple of minutes to soften. 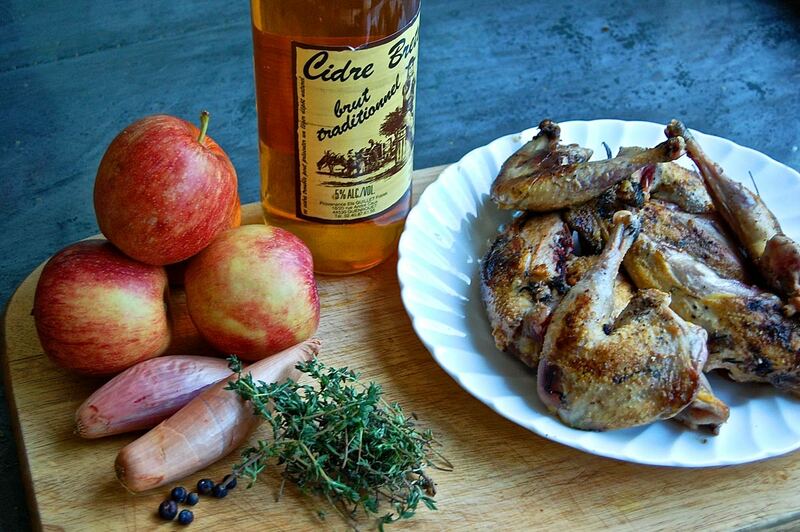 Return the pheasant to the pan with the juniper berries and pour over the cider. Boil for a minute to cook off the alcohol and reduce the liquid slightly. Add the stock and season well. Reduce to a simmer, cover with a piece of baking paper and cook gently. After 20 minutes, take out the breasts, then cook the legs slowly for another 20. Remove the pheasant pieces from the pan and boil for several minutes to reduce the liquid by about half. Whisk in the crème fraiche and taste for seasoning. In a large frying pan, melt the butter and fry the apple pieces. Resist the temptation to turn them often to allow them to brown well without breaking up. Put the apple into the sauce with the pheasant pieces and serve.